Lawmakers are fooling themselves if they think they'll be able to quickly and simply clean up the mess if they go over the "fiscal cliff," argues budget expert Charles Konigsberg. Charles Konigsberg, policy chief of NEMA, was the director of the Domenici-Rivlin Bipartisan Debt Reduction Task Force and served as assistant budget director in the Clinton White House. If Democrats and Republicans fail to figure out a way to avert the fiscal cliff before the end of this year, they are fooling themselves if they think they'll be able to clean up the mess easily when Congress gets back in January. Some may assume that it will be a simple matter to roll back the tax hikes and un-wind the spending cuts before significant damage is done to the economy. They are wrong. First, reinstating some or all of the Bush tax cuts won't be easy. Why? For the same reason lawmakers are having a hard time coming to an agreement now. Democrats will only want to reinstate today's rates for incomes up to $200,000 for individuals and $250,000 for joint filers (or something similar). And Republicans will still push for today's rates to stay in place for everyone. Passage of a new tax bill in the Senate requires 60 votes to avoid a filibuster. That's always tough to achieve and could be even tougher next year, if the body becomes even more narrowly divided than it is now. Some suggest that tax cuts could be reinstated using a fast-track "budget reconciliation bill," which only requires 51 votes in the Senate. Realistically, though, such a bill would not be completed until late spring or early summer because it must be preceded by a full debate on a congressional budget plan. And in a narrowly divided Senate, getting 51 votes could still prove tough. 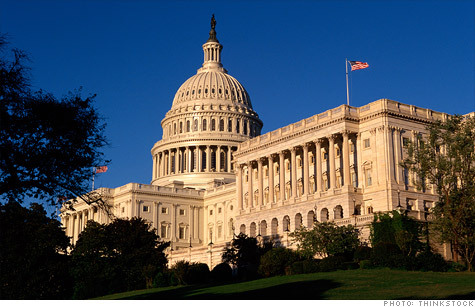 Second, unwinding the automatic spending cuts scheduled to take effect on Jan. 2 won't be easy. Defense spending -- except that for military personnel, which President Obama has exempted -- will be cut by about 11% across-the-board to achieve the required $55 billion in defense savings for 2013. Domestic discretionary programs -- except certain low-income and veterans' programs that are exempt -- will be hit with across-the-board cuts of about 8% to achieve the required savings. And Medicare, which is always hard to negotiate, faces a 2% cut. 0:00 /3:57What the heck is the fiscal cliff? Practically speaking, the funds being cut will be canceled immediately on Jan. 2. That means Congress would then need to negotiate and pass a new appropriations measure to restore them. Such negotiations would not be short or simple. That's because the decision to repeal or replace the cuts will be just as fraught with political roadblocks as it is today. Imagine trying to convince lawmakers on the ideological right to restore the non-defense funds, and trying to convince those on the ideological left to restore defense funding. Bottom line: If the fiscal cliff isn't resolved by early January, the U.S. economy could fall into a recession, complete with higher unemployment. Should that happen, lawmakers will have no one to blame but themselves.